Think about this for a minute: a plate of carbs (pasta), served with more carbs (toasted breadcrumbs). The breadcrumbs in this recipe are very symbolic – they are meant to represent sawdust (since Saint Joseph was a carpenter), and cheese (since this was a poor man’s dish). This is a classic example of cucina povera -which literally means “cooking of the poor”. Another example of this peasant cooking would be this recipe for Cacio e Uova or this easy recipe for Pasta and Lentils. Perhaps this pasta with breadcrumbs recipe doesn’t sound very appetizing to you. I assure you that once you taste it, the combination of sweetness with the mild nutty flavor really works well with the pasta. What do I need to make St. Joseph’s Spaghetti? Olive oil: Extra virgin if available. Garlic: Feel free to use more than the stated amount. Coarse breadcrumbs: Homemade if possible. Parsley: Provides a wonderful contrast in color as well as a clean bright flavor. Golden raisins: A wonderful burst of sweetness. Spaghetti: The pasta of choice when making this dish. Look for spaghetti no 5. Orange rind: Optional, but provides a citrus undertone. As far as accessories are concerned, you will need a large pot to cook the pasta as well as a colander. Also required is a wooden board and a sharp knife to properly chop up the garlic, walnuts and parsley. Finally a large skillet and a wooden spoon to stir fry a few of the ingredients. In a large skillet, saute the garlic in the olive oil for a few minutes. If using anchovies, add a couple of them at this point. Add the breadcrumbs and a couple of tablespoons of olive oil and continue to saute. Add the walnuts, raisins and parsley and saute this mixture until the breadcrumbs are golden brown and toasty. Meanwhile, cook the spaghetti according to your package label. Add one cup of pasta water to the bread mixture if it appears dry. Once the spaghetti is cooked, simply combine the two by layering in a large bowl. This pasta dish can be served hot or at room temperature. Based on my personal experience, this is one of those dishes that you either love or hate. As you can probably guess, I belong to the group that loves this recipe. As you can well imagine, this is another recipe which was part of my Italian heritage. In my upbringing, Saint Joseph’s Day Spaghetti recipe was only served twice a year: Christmas Eve and on March 19th in honor of Saint Joseph. As you are probably aware, there is another more popular food tradition celebrated on this day: Zeppole di San Giuseppe (just follow the link for the recipe). I still have vivid images of my paternal grandmother standing on a chair, armed with a large wooden paddle (which my dad had made) stirring the freshly ground bread crumbs in a pool of olive oil in an industrial sized stock pot. How could I forget the sweet aroma and the sound of the garlic sizzling in the olive oil? And then the moment when my grandmother decided that it was time to add the bread crumbs, well everyone had to stand back for fear of getting splattered with oil. It really was such a dramatic event… I can’t help but smile when I think of those moments. As a child, I was so impressed with the authority, confidence and pride my grandmother had when she made this dish. This dish represented her roots, in the rural town of Ripabottoni, in the province of Campobasso, in the Italian region of Molise. 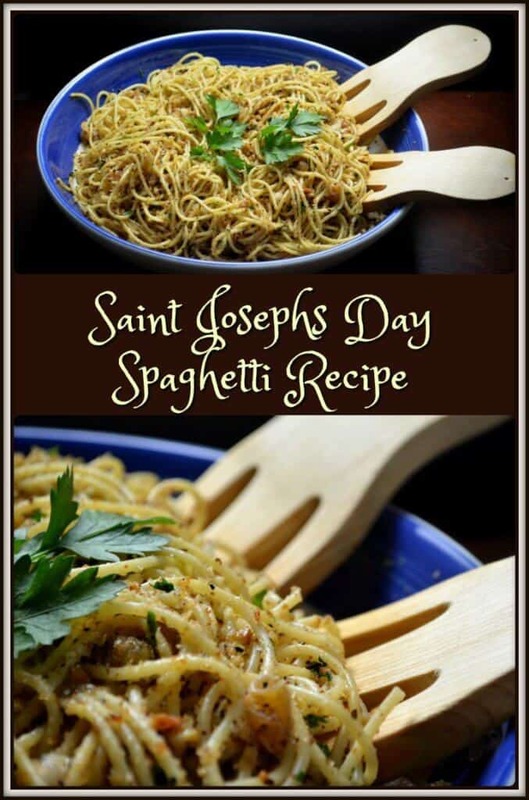 On March 19th and on Christmas Eve, family and friends are always welcomed to drop by and have a meal together and enjoy this simple recipe for Saint Joseph’s Day Spaghetti! 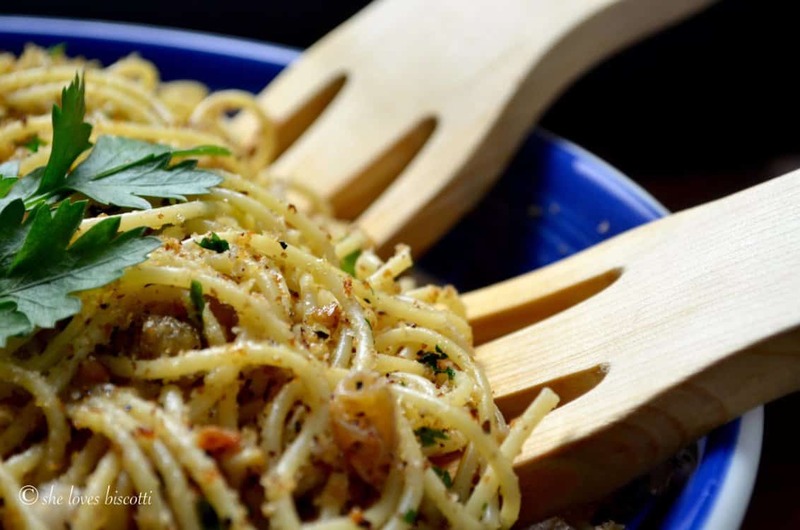 ★★★★★ If you have made this recipe for St. Joseph’s Spaghetti, I would love to hear about it in the comments below and be sure to rate the recipe! 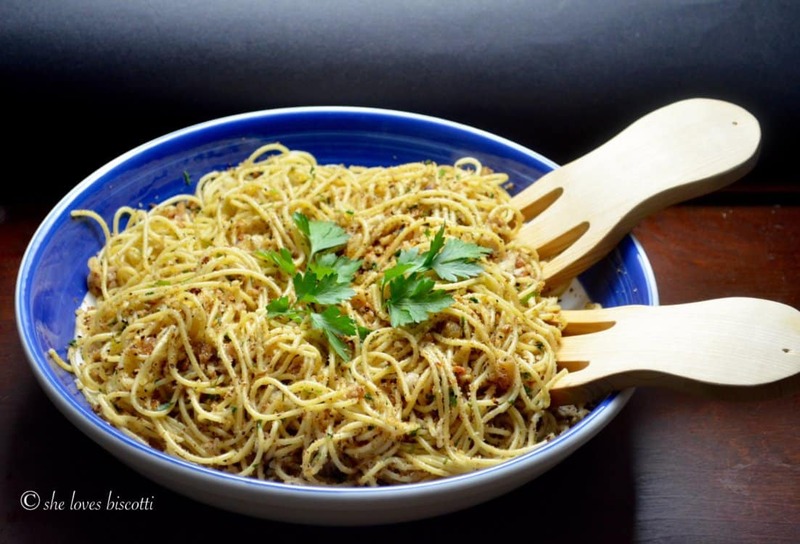 Spaghetti which has been coated with a mixture of olive oil, breadcrumbs, walnuts, garlic, golden raisins and parsley. 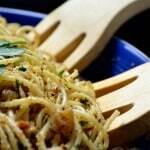 Saint Josephs Day Spaghetti recipe. In a large skillet, over medium heat, heat about 2 tablespoons of olive oil. Sauté the garlic until fragrant, 1-2 minutes (do not brown). Reduce heat to medium low and add the breadcrumbs. Add 2 more tablespoons of olive oil and combine. Stir together for about 2 minutes (breadcrumbs will get slightly toasted and should absorb the oil). Add the chopped walnuts and stir fry for another 2 minutes. Add raisins and parsley. Stir to combine for 1-2 minutes. Set aside. Add up to 1 cup of cooking water (from the pasta) if mixture appears to dry. OPTIONAL: Add orange rind and combine with the raisins and parley. Meanwhile bring a large pot of salted water to a rolling boil. Add the spaghetti and cook until al dente. Drain the pasta and reserve about 1 cup of the cooking water. Drizzle 2 more tablespoons of olive oil. In a large serving dish, alternate layers of pasta and bread mixture (top with bread mixture). Note: Remove orange rind if used in the mixture. Garnish with parsley and drizzle remainer oilve oil. Feel free to adjust the amount of garlic, walnuts and raisins based on personal preference. I have never heard of this recipe but I’m pretty sure I’m going to love it. Your words really impressed me. Reading about your experience was so heartwarming. Thank you for sharing it. Thanks so much Wallie. Hope you get a chance to try it. Truly appreciate your kind words, thanks again! My mom used to make this dish for us but she used to add honey and she used perchitelli maccaroni instead of spaghetti, She didn’t use walnuts. What fine memories we have of this. How wonderful Francine ♥ It never seizes to amaze me how food can bring us back in time… thanks so much for taking the time to share your story. Appreciate it 🙂 Have a wonderful week-end! It’s the first time I hear of this dish, but knowing Italian cuisine, it can only be amazing!! And I love that memory of your grandma. Food has this power of taking us back in time. Maria, I haven’t heard of this dish, but to me it sounds delicious! I can’t wait to try it. This looks and sounds amazing! I always think I’m not going to like raisins in dishes but then end up loving them in there. I will have to give this a try. I’m pretty sure I would be in the “love it” category! Oh my goodness, it sounds so good! Will pin this for future use… that combo just sounds amazing. This is new to me, but I think all the textures along with the sweet and nuttiness of the dish make this sound divine. Love the memories associated with the dish and how amazing that you know so much about your family’s history. Thanks!